Located in the heart of Orange County’s busy Corona del Mar, entering the Sherman Library and Gardens is like stepping into another world. This 2.2 acre botanical wonderland is a living museum, with plants that span the globe and brick walkways that wind between ornate patios and conservatories. The Sherman Library and Gardens are ideal for couples with a “green thumb” or just those that want a tranquil and natural setting for their wedding day, whilst still being within close proximity to upmarket hotels for themselves and their guests. The Sherman Library and Gardens features a Cactus and Succulent Garden which surrounds an impressive California pepper tree, while its Tropical Conservatory hosts blooming heliconias, orchids and wild ginger. You can wander through the Japanese Garden with its sacred bo tree and the lush Fern Grotto, then take in the breathtaking scents of its Rose Garden. The library itself houses an outstanding collection of Pacific Southwest heritage material that follows the transformation that has taken place across California, Arizona and parts of Nevada over the last century. It offers a fascinating insight into the region for both your local wedding guests and those from out-of-state and beyond. After getting ready in the bridal dressing room, wedding ceremonies are held within the Tea Garden Patio of the Sherman Library and Gardens, surrounded by blooming foliage. 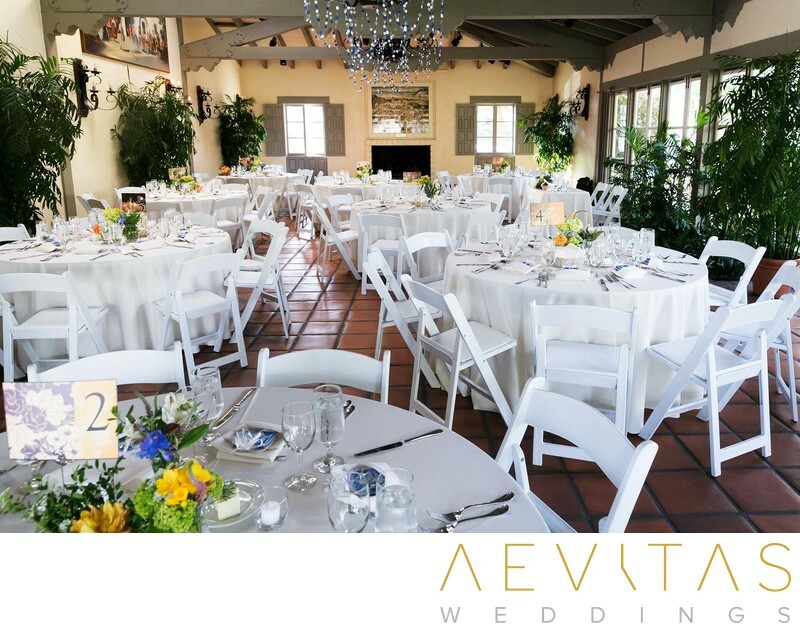 There is the capacity to host up to 300 guests, with the late afternoon light creating a whimsical ambiance as you exchange vows, watched on by your loved ones. Then wander through the wisteria-covered arbor and along the shaded walkways for a romantic couple portrait session, utilizing the tiled patios, flowering beds, bubbling fountains and fern-covered waterfall as backdrops. Then join your guests on the Pepper Tree Patio for cocktail hour as hors d’ouevres and beverages are served as the evening sets in. Receptions at the Sherman Library and Gardens are held indoors within their Central Patio Room, whose wooden beams, cathedral-like ceiling and white-brick fireplace give a cosy, vintage ambiance to the space. French doors lead to a covered terrace where your guests can mingle and take in the spectacular garden views. Couples can select from the Sherman Library and Gardens preferred list of caterers, while beverages can be brought in depending on the couple’s individual tastes and desires. Rather than being a venue to party into the early hours of the morning, weddings at the Sherman Library and Gardens are more relaxed affairs, offering you and your guests the opportunity to soak up the outstanding botanical surrounds.